Launched on June 11, 2008, is one of several state-of-the-art observatories currently observing the Universe across the electromagnetic spectrum from radio to high-energy gamma-rays. 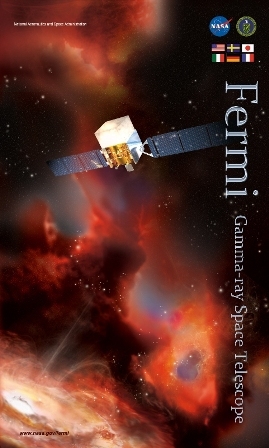 The Fermi mission was built by a partnership of particle physicists and astrophysicists from the United States, France, Germany, Italy, Japan, and Sweden. It is providing new information about sources of high-energy radiation from neutron stars in our galaxy to super massive black holes in distant galaxies. Fermi’s enormous leap in capability compared to previous observatories has opened a window of discovery that may provide information about the identity of the invisible and unidentified “dark matter” of the universe . The revolution in understanding of our universe that is now underway has come about because of the large amount of new information that has come from observatories, both ground and space-based, that are only possible because of continuing advances in technology that have allowed us to view the universe across the electromagnetic spectrum. For example, from space, WMAP and now Planck are measuring the properties of the microwave radiation left over from the birth of the universe; the infrared vision of the Spitzer Space Telescope allows us to peer into regions of space which are hidden from optical telescopes such as the center of our Milky Way Galaxy containing newborn stars; the refurbished Hubble Space Telescope continues to provide unprecedented deep and clear views of the Universe, ranging from our own solar system to extremely remote fledgling galaxies forming not long after the Big Bang; the Chandra X-ray Observatory and the XMM-Newton satellite observe X-rays from high-energy regions of the universe, such as the remnants of exploded stars or from the hot gas gravitationally trapped by clusters of galaxies; and the Fermi Observatory covers the highest energies ever observed from a space-based observatory, allowing us to see an otherwise invisible universe.